The annual Port Dover Christmas/Charity Pub Crawl is becoming more successful with each passing year. 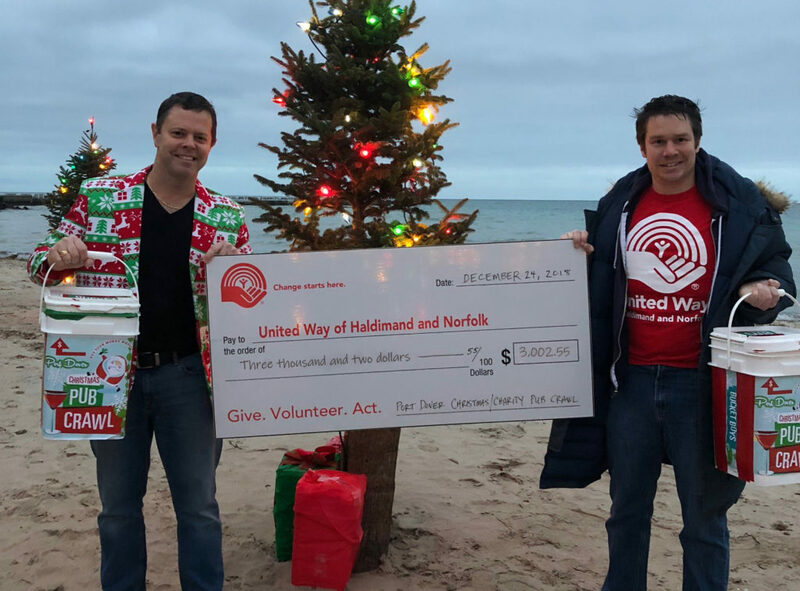 This year’s event supported United Way of Haldimand and Norfolk, bringing in a grand total of $3002.55. The money was raised in less than 7 hours with two teams competing to see who could raise the most funds. The women’s team “Babes” competed with the men’s team “Boys” with the women’s team coming out on top raising almost double the amount of the men’s team. This was a fun event with approximately 45 minutes at each stop which started at The Beach House and then on to the Fisherman’s Catch, The Terrace Room, Southside Louie’s, The Brig at the Norfolk Tavern, and Two Eleven Main. 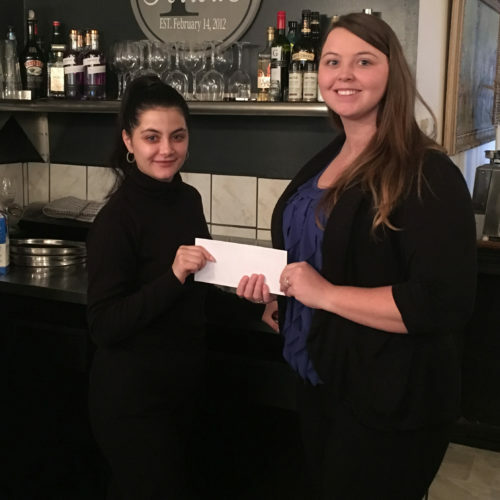 We had a blast at our annual Fashion Show at The Coach Pyramids, 250 Argyle Street North, Caledonia on September 20th at 6:30 p.m.
To watch the video see our facebook page. Sometimes raising money is just plain fun! On September 20th we had our annual fashion show at The Coach Pyramids in Caledonia and we shopped for a good cause. Fun, fashion, wine tasting, door prizes and shopping for a good cause. Thank you to all those who participated in this event. Check out your local newspaper (Simcoe Reformer, Port Dover Maple Leaf and Haldimand Press) to see our ad expressing our thanks to those who helped to make 2017 a success. 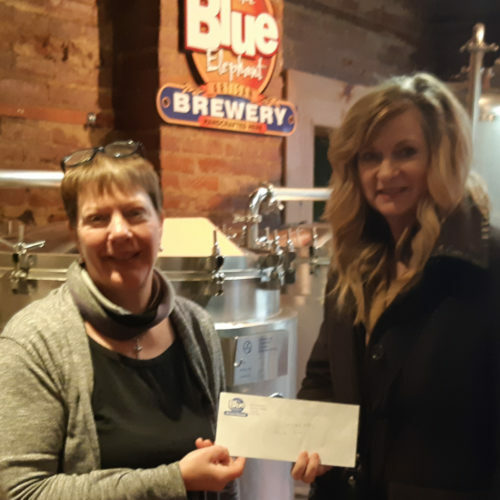 Thank you for helping us make a difference in the Haldimand and Norfolk communities. 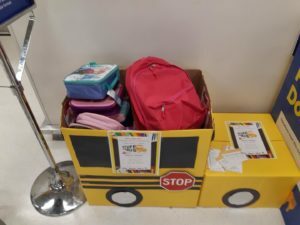 We are still looking for volunteer Jail Birds for our Jail & Bail event and this is the last weekend for our Stuff the Bus school supplies drive. Donate at our locations: Superstore (Simcoe), Zehrs (Caledonia), Giant Tiger (Hagersville & Dunnville). Look for the yellow bus. 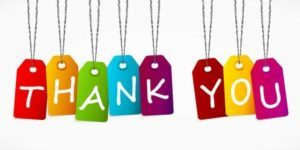 Our Day of Caring event on August 16th at the Haldimand Abilities Centre in partnership with Libro Credit Union was a great success. Volunteers worked hard to beautify the sensory garden. After a full morning of weed pulling, hedge trimming, painting picnic tables, and more, the change was impressive. The sensory garden supports the needs of people with dementia, vision loss and brain injury. It has great therapeutic and educational benefits and is helpful for dealing with disabilities that affect sensory responses. They also grow their own vegetables and herbs that they use in meals for their clients. Check out our “Day of Caring” information page to see how your organization can get involved. We are hosting our first “Stuff the Bus” school supply drive, to collect new school materials for low-income students in our community. The drive will run from August 18 to September 1, 2018. Look for our donation bins in our partner stores: Superstore (Simcoe), Zehrs (Caledonia) and Giant Tiger (Hagersville and Dunnville). Community members are encouraged to donate new school supplies from a provided “wish list”. 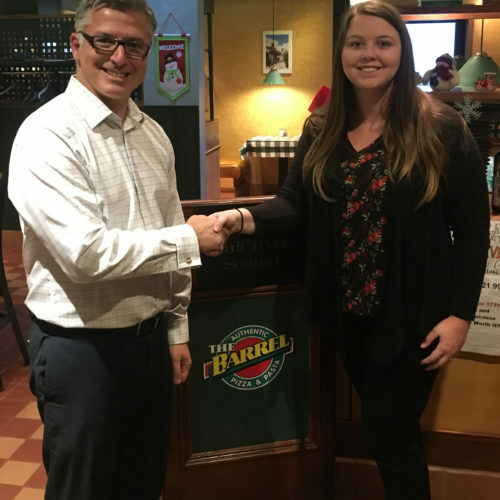 New school supplies can boost a child’s self-esteem, providing the ability to start school more compelled to learn, says Brittany Burley, Executive Director of United Way of Haldimand and Norfolk. 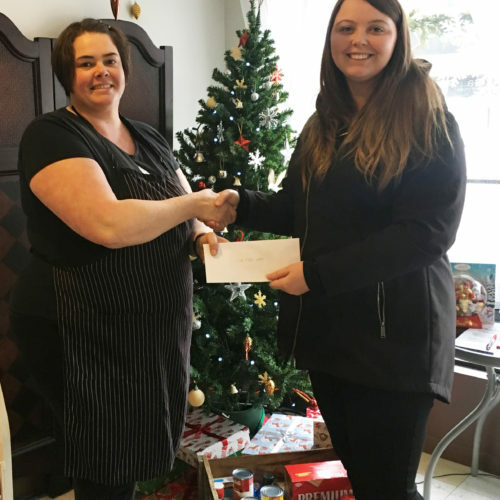 Our goal is that every child in Haldimand and Norfolk, regardless of family income, has all the supplies they need to succeed. 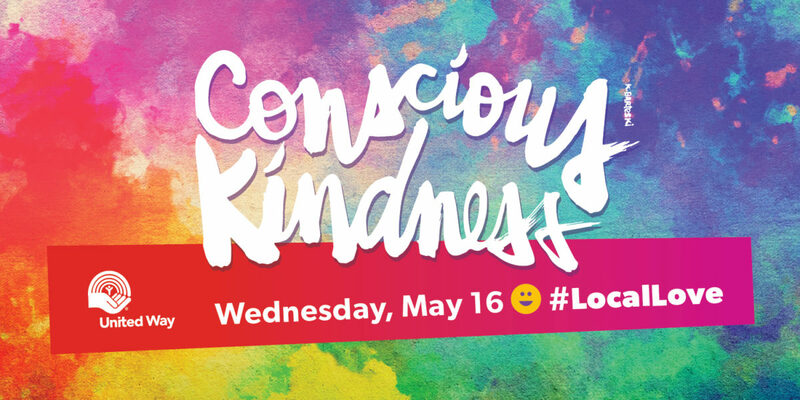 United Way’s National Conscious Kindness Day is coming up on May 16, 2018. On this day, we invite you to help spread a culture of kindness in your community! Be part of United Way’s Conscious Kindness Day by planning some treats for your staff, customers, or constituents! It’s an easy way to get your workplace or organization working together for a better community. Spread the #locallove on May 16th. Do you believe in building strong communities? Do you think kids should have the opportunity to grow up to be all that they can be? Would you like to create possibilities for people in Haldimand and Norfolk living in poverty? 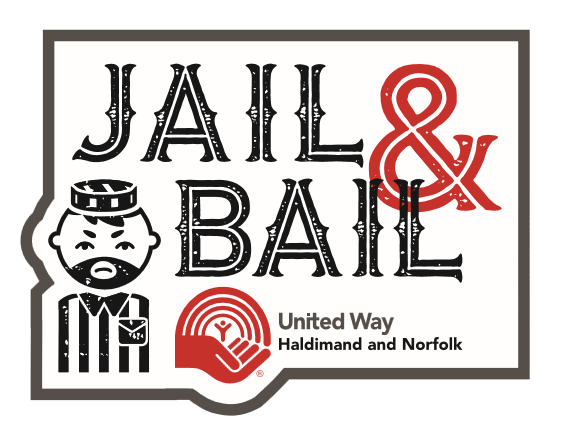 If so, then United Way of Haldimand and Norfolk needs you! We are currently recruiting Board Members with a strong interest in creating positive change in our communities. Board members make a commitment to a two year term. Please note, this is an unpaid volunteer position. Job Summary: The Board Member participates in the policy making, planning, goal setting and evaluation activities relating to all aspects of the United Way of Haldimand and Norfolk, while adequately representing the interests of the community at large. The Board member assumes legal and moral accountability for all activities of the United Way and participates on Board Committees as required. This position reports to the United Way Board of Directors. 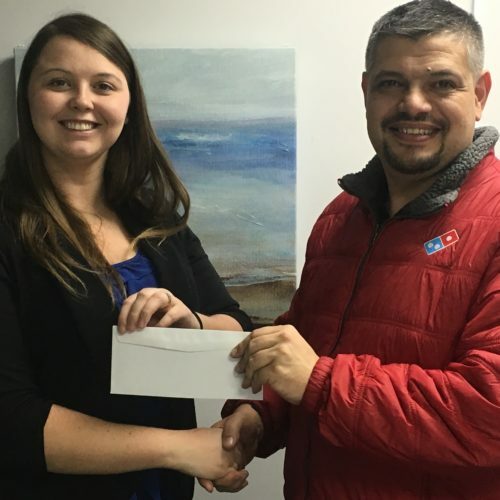 Supports the values and mission of the United Way. Makes a personal commitment to the United Way of time, effort and financial support to the best of their ability. Maintains a current knowledge of United Way policy in all areas. 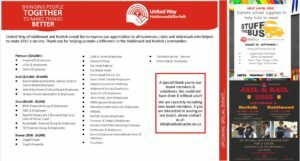 Participates on the Board of Directors in accordance with the by-laws of the United Way. Participates in the development of long term and short term United Way goals and objectives. Represents the United Way and acts as an ambassador for UW at public events. Attends as many of the United Way’s special events as possible. Ensures that community interests are adequately represented and/or considered prior to decisions being made by the Board of Directors. Actively promotes the United Way objectives on a year round basis. Conflict of Interest: Board Members must take great care to avoid potential conflict of interest situations. Where it exists, the director is advised to declare such conflict and to avoid participating in any discussion or voting on the issue. Demonstrated interest in the United Way goals and objectives. Genuine concern for people and the wellbeing of the community. Public Relations/Communications or Agency Relations. Works or lives in Haldimand County or Norfolk County. Willingness and availability to participate on the Board of Directors and various committees. Applicants are welcomed from all age groups. We are particularly interested in individuals with the following skills: accounting, public relations, marketing, revenue generation, and community development. Previous non-profit work or governance experience is an asset. If you want to make a difference by joining United Way as our newest Board Member, please submit your resume and cover letter to the organization’s Executive Director at: [email protected] by March 16, 2018.